What to eat? The temperatures are soaring, it’s humid, the appetite isn’t up to much. But you know you’ve got to replenish your weary body. And, if you’re anything like us and you love your food, you’d like to actually sit and enjoy putting those energy-giving calories back in! Thank goodness then for Turkey’s melon season and this really easy melon salad recipe. 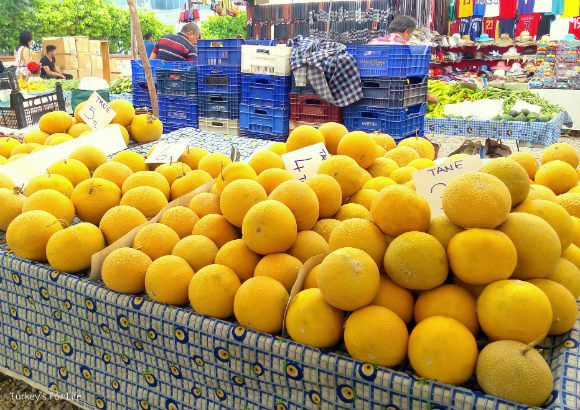 Turkey is a major producer of the galia melon and, at this time of year, Fethiye Market and Çalış Market are packed with melon stalls and trucks filled with galia, honeydew and huge watermelons. They’re great (if a tad heavy to carry home) just to buy, cut up and then eat straight from the fridge. But they’re also great for a more savoury melon salad. There are lots of variations to fresh salads containing melons. Play around and investigate for yourself. This galia melon salad recipe is one of our favourites just because of the different textures and flavours. It’s still light but the addition of nuts and cheese gives us a bit more energy and nutritional content. We’re really lucky in Turkey that galia melons and other melon varieties are so abundant and affordable. If you are buying them, just be careful with the price, otherwise you could be in for a shock. In early season, they are obviously more expensive, and, sometimes, the price advertised is per kilo – not the full melon. In the photo above, the tickets for the galia melon say ‘tane.’ This means the price underneath is for each melon. So, no surprises when you come to pay. So, if we’re going to be making this melon salad, let’s have a look at some of the goodness we’re going to be getting from our main ingredient. The galia melon is a hybrid of the cantaloupe melon and the honeydew melon. Where possible, we use galia in this salad because of its texture and juicy sweet flavours. You can use alternatives if you like. This galia melon salad is light and refreshing for the hot summer months. It's also packed with nutritional content and the addition of nuts and cheese makes it a more substantial meal. First of all, remove the flesh from your galia melon. You can either do this by creating melon balls or by quartering the melon and using a sharp knife to slice away the flesh from the skin. Chop your galia melon into bite-sized chunks and arrange in a serving bowl. Now sprinkle your onions and mint leaves over the top and mix everything together. Using your fingers, crumble your cheeses into the melon salad, making sure the cheese pieces are in small chunks. Stir your cheese in, gently. 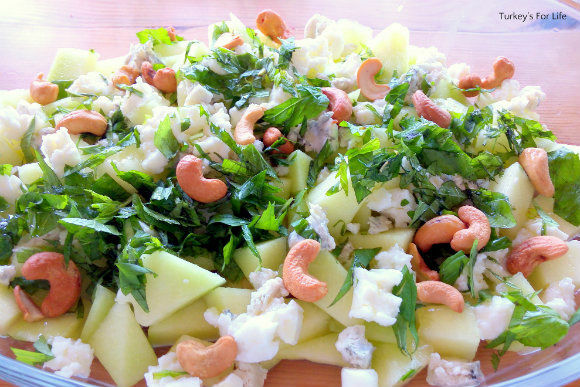 Now sprinkle your cashew nuts over the top of your salad and drizzle olive oil and nar ekşisi over them. As with all of our recipes, this cheese and galia melon sald recipe has only an apporoximate calorie count. It is up to you how much dressing you want to use or which cheese brands. Allow around 200 g of galia melon per person in this salad. In Turkey, we use a low fat white cheese as this is a harder cheese. Use full fat if you want a creamier texture. Nar ekşisi is popular in Turkish cuisine and is a sauce of pomegranate molasses. You can use balsamic vinegar if you can't get nar ekşisi. 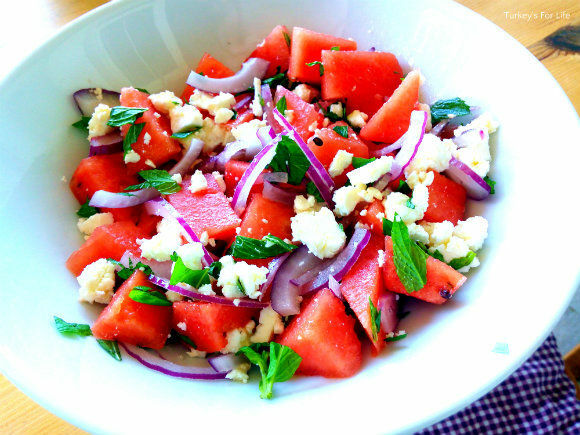 And that’s our galia melon salad with mint and feta – and a hint of blue cheese for that all important extra flavour. Served straight from the fridge, we have the cooling, jucy lemon pieces and the fresh flavours of the roughly chopped mint leaves. White Turkish cheese and a few crumblings of blue cheese add both creaminess and flavour – the blue cheese works so well with the galia melon. And then, rather than add salt, we go for texture and saltiness with a handful of salted cashews sprinkled over the top. Olive oil and nar ekşisi dressing over the top and you have yourself a perfect summer melon salad. What If I Prefer Watermelon? If you’re thinking about how to make watermelon salad (karpuz salatası), then it’s really simple and so colourful. We love this salad, too. A slight variation on the recipe above as it’s just a melon salad with mint and feta. Exchange the onion for red onion and just look at the fabulous colour in your bowl. How can you not want to eat that, eh? Don’t forget your drizzle of olive oil and nar ekşisi before you tuck in. 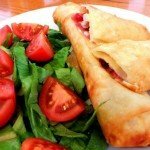 We have added this recipe to the Meze & Salad section of our Turkish Recipes collection.